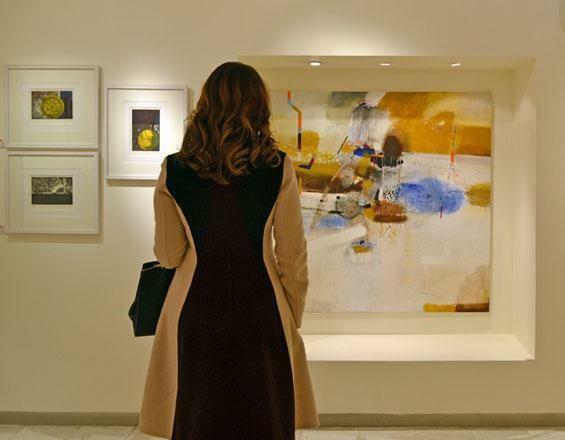 (MENAFN - Jordan Times) AMMAN — From the visual aesthetics of Arab poetry to the history of Al Andalusia, Orient Gallery opened its doors to welcome its visitors to their group show 'Aesthetics'. On Tuesday evening, Orient Gallery presented a show uniting diverse artists from Jordan, Bahrain and Egypt. The show, which runs till February 28th, aims at creating a 'cultural dialogue' among five notable Arab artists. 'With our diverse motives and different technical preferences, what gathered us here was the craft of the creative practice itself,' Mohammed Ameri, one of the participating artists told The Jordan Times. Mohammad and Jehad Ameri, both participating artists, grew up together with a common appeal for poetry, yet it homed into completely different aspects of their lives. Mohammed, being inspired by the great poet Mahmoud Darwish, created a poetic visualisation through an accordion-like art book influenced by Darwish, while his brother, Jehad fused his fascination with the culture, poetry and women of Al Andalusia into his work. Jehad, an established professor at the University of Jordan's Faculty of Arts, is known for his career as a prominent graphic artist, and never depends on just one technical approach for producing his work. 'What is more important is how I utilise the 'layering' technique to serve the concept of underwater reflections,' he added. Abbas Yousif, a Bahraini artist who is also showcased at the exhibition, said that, much like Mohammad, his paintings are a tribute to the poetry of Darwish. Yet, his approach is different, as the words in his paintings are displayed in an unreadable way, which allows him to abstract calligraphy into a pure intersection of lines and colours. Jamal Abdul Rahim, another Bahraini artist, also exhibited works centred on the letters of the Arabic language, yet he merges them with figurative forms. His works show his in-depth experimentation, and introduce new mediums to the etching technique in the field of printmaking. Ibrahim Tanbouli, creates a visual experience of a busy 'crowd' in Egyptian streets. 'After studying the possibilities of what I can add to the visual language, I realised that I can only integrate the mature expression of my existence,' Tanbouli said. In response to a question by The Jordan Times on whether his choice of palette is purposely fauvist or not, Tanbouli explained that although he does not have a preset vision for how his artworks will look, the palette is sometimes subtly inspired by the colours of The Mediterranean Sea. 'I come from Alexandria... There is always harmony between the colours of that city and The Mediterranean Sea. For that reason, the blue hues dominate many of my works'. The exhibition mainly showcased works from across traditional media including painting, sculpture and graphic art. Although other forms of art can be viewed more widely overseas — such as installation or video art — Jordan still seems to be behind in terms of showcasing more contemporary forms of art.